This... this will not end well. DC comics has just announced that Frank Miller, one of comics’ greatest creators who has since devolved into one of the comics’ world’s weird crazy uncles, is creating a third volume in the saga he began with The Dark Knight Returns, to be titled The Dark Knight: The Master Race. As Wonder Woman’s crushed, shattered torso is to a regular rib cage, so was Strikes Again to The Dark Knight Returns. The good news is that Brian Azzarello will apparently be co-writing with Miller, presumably in hopes of heading off the horrifying shitstorm of cultural insensitivity that is almost 100% certain to follow. But for god’s sake, it’s called The Master Race. 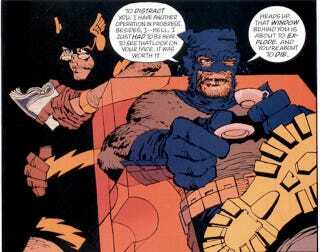 I feel like the chances of Frank Miller being... well, being Frank Miller are pretty goddamn high. The fact that this thing is subtitled The Master Race should be filling DC executives with abject fear. I mean, it’s no great mystery what DC is thinking — this is the 30th anniversary of The Dark Knight Returns, and despite the fact Strikes Again was an incomprehensible mess it made money — but man. This will bring nothing but disaster.